Streamlines all your center's operations and your customers' online experience. with features built for centers like yours! A good registration process starts with easy to follow and customizable class setup. Art Center Canvas uses the same process for classes, camps and workshops. Make it easy for your customers to become members with discounts for classes and gift shop sales. You have the flexibility to allow as many memberships levels as you need. Scheduling and rescheduling private lessons can get complicated. You will have all the tools to setup, drop, and reschedule lessons in 30, 45 and 60-minute increments. One shopping cart for class registration, tickets and sales from your gallery or gift shop. You will never be caught short of sale items with inventory control features as well. Make it easy for your customers to become donors with online donations and recurring payment plans. Art Center Canvas has a Dashboard to track your fundraising goals. Account information for registrants, members and donors and their transactions all in one repository. Use customizable and automated email and letter templates. No separate software needed! Manage and sell general admission tickets for events with or without a fee. Each event can have four ticket price levels plus complementary level. Easily manage artwork intake, sales to customers and returns to artists with our Exhibit Management module. Allow artwork to be uploaded for your juried exhibits. Art Center Canvas is cloud-based software that arts and music organizations use to stay organized and connected to their customers. Art Center Canvas can streamline your operations and scale with ease. Can CANVAS display class registration from my website in a way that's appealing to my audience? CANVAS webpages mirror the appearance of your public website, and updating class registration information on your public website is a snap using CANVAS easy and intuitive interface. Backoffice and public website integrated seamlessly! How flexible is scheduling classes on CANVAS? How does CANVAS manage membership and membership benefits? CANVAS allows unlimited membership levels, and each membership level can be assigned a different discount CANVAS allows you to establish if a discount applies to Purchaser or all of Purchaser's Household (partner and children). CANVAS checks Membership Status when items, such as purchasing classes, supplies, tickets etc. are placed in shopping cart. How does CANVAS keep track of all the ways our students, members and donors engage with our center? Each Participant/Household has an account with a history of participation (classes, supplies, events, donations) in CANVAS CANVAS has a wide range of data fields. It can collect customer's information such as seasonal addresses, demographics, class attendance and much more. CANVAS can track and report what is important to you and your community. Does CANVAS offer Private Lesson Scheduling (one-on one teaching)? CANVAS allows you to schedule instructors' time in 15-minute increments to allow for 30, 45 and 60 minutes lessons over a specific semester or session. If your instructors teach more than one instrument, CANVAS has you covered, allowing you to specify the instrument. Instructors can see their lessons schedule in the internal calendar system. Can CANVAS convert my customer data from our current system? MS Excel spreadsheets and FileMaker Pro which is a glorified poster. These are flat files with no dynamic relationships. When we need tech support who do we contact? We want our clients and their staff to be comfortable using the system, so the first 90 days you have phone support, as well as online chat and online issue tracking support (similar to email support). Thereafter, if an issue requires our immediate attention, pick up the phone for help. Otherwise, online chat is great for how-to-questions, and online issue tracking is great for issues that require an explanation and tech intervention, such as fixing user error or changing reports or business rules. How does CANVAS online issue tracking work? If an support issue requires an explanation to identify the problem, you can create a support ticket in the issue tracking system in CANVAS. Whenever a support ticket is created, it is reviewed by a support specialist within 15-30 minutes and updated with a current status. You will receive a pop-up whenever the issue is updated with a question or resolution, and you can add comments when necessary. Will my in-person and online transactions populate into my Accounting System? CANVAS integrates with Quickbooks (QB) DeskTop and QB Online. Your bookkeeper stays on top of daily, weekly transactions in two steps. You can populate the several QB general ledger accounts for your classes, supplies, donations and ticketed events revenue. What development software integrates with CANVAS? We currently integrate with Bloomerang for Donor Development and Tableau Data Visualization for great dashboards on everything else. If I wanted to keep my CRM software, which ones integrate with CANVAS? CANVAS has its own CRM features for sending emails and letters. From using customizable templates to automatically generated emails and letters. We currently integrated with Constant Contact and MailChimp. But, go ahead and ask us if there is another software package you want to use with CANVAS. Request a free demo of the popular features of the software. Questions? Check out our F.A.Q section or contact us. Join our community of art centers and music schools who are rethinking communal arts education across the country. From after-school programs, date night and exhibits, we enable them to run their operations more efficiently so they can focus on their community. The Clay Studio offers ceramics classes, workshops and sells ceramic arts from well-known artists around the country. To grow, it needed to offer online class registrations, memberships and art sales. Art Center Canvas converted registrant, member and class data stored in FileMaker Pro to its cloud-based application, enabling customers and members to easily register for classes and workshops online. Online transactions for classes, membership and the sale of artwork were $110,000 in the first full year using Art Center Canvas. The number of classes registered increased by 27% adding 500 additional classes registrations from the prior year. The Clay Studio also had a record number of new members -- 50% more than last year. It is amazing how online sales dominates revenue generation. In the first year, revenue from online class registrations was 33% of the total registration revenue. Today, 67% of class registration revenue is from online sales. 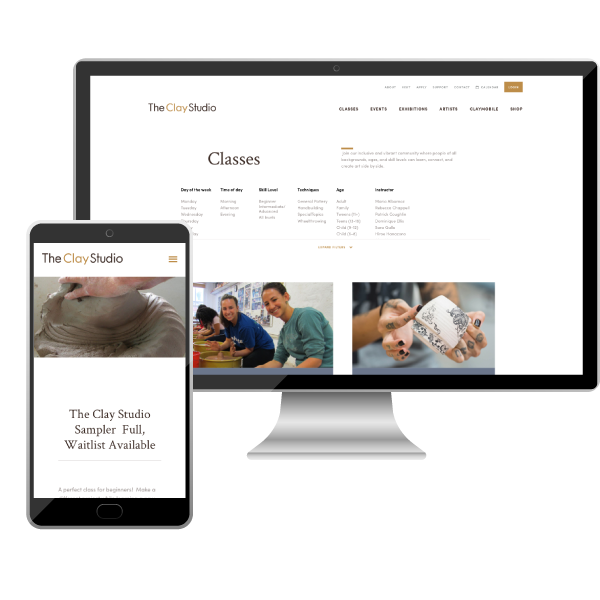 Since taking class administration online, The Clay Studio has nearly tripled the number of class registrations and doubled its class registration revenue. Art Center Canvas has enabled The Clay Studio to scale its operations for phenomenal growth. "Art Center Canvas offers all the flexibility we need to customize our classes, workshops, camps, date nights, donor levels, member discounts, and now our online store to encourage our community to support our mission. Each year, we serve over 40,000 artists, students, collectors, arts enthusiasts, and community members through a myriad of clay focused programs." "Art Center Canvas has worked closely with Perkins Center for the Arts to make improvements and updates that have added an incredible amount of efficiency to the way we do business. If your business is in the arts and you use multiple platforms to make it happen, Art Center Canvas can help you make things easier." "Art Center Canvas has changed the way we run our organization. We used to run separate applications and databases for fundraising, exhibitions, student registrations and accounting. Now everything happens in one place, reducing staff time, and allowing the entire team to have access to our customer/participant information. The staff at AAC are incredibly responsive - creating reports as needed for organization’s specific information, and support issues. I can’t imagine how we could do what we do without ACC! " "We chose to work with Art Center Canvas because they specialize in serving art organizations. Our workshop registration process is fully integrated with our website, and when we redesigned our site last year, the ACC folks were deeply involved with our developers so that everything ran smoothly at the launch. We appreciate that ACC provides flexibility to grow and change as our needs grow and change; we wouldn’t find that personal approach with a larger company. "